It’s divisive in its minimalism, but we love the simple design. The audio quality is great; the listening experience is very accurate. Lacking in extra features to bulk out the offering. Not a lot of component customization or extension options. Pro-Ject are an Austrian company with a name that sounds a little like an early 2000s DJ who never quite realised his dreams of making it in the club scene. Turntables are their bread and butter, so let’s dive in. To be honest, the aesthetic of the Debut III is going to be fairly divisive. We really like it, but you might not. And that’s okay. That’s the kind of difference that makes the world go around. So what is there to like? Well, it’s one big exercise in minimalism. If you didn’t know better, the entire turntable could be mistaken for a non functioning prop that wasn’t actually capable of playing music. It’s just that simple. The Debut III is available in 7 color options. And, in this context, the color option is a pretty big deal as it affects the entirety of the base of the turntable. Ours was finished in piano black which, as it sounds, was a very muted affair. A plain, black finish. A plain, black platter. A plain, black tonearm. It may sound dull, but the actual effect is extremely stylish and elegant. And if you prefer something which pops a little more, there are bright red, green, and blue options for you to choose from. The minimalism of the aesthetic design is mirrored by Pro-Ject in their approach to the feature list. Which is to say that there isn’t a whole lot going on. That’s not a bad thing per se, and we tend to find that turntables in this price range do not put much of an emphasis on the feature set relative to both the look and, more importantly, the sound of their turntables. This is often the case in mid-tier products as they have to decide what to emphasize and what to invest their resources into to create an affordable end result. The Pro-Ject Debut III is very much an all in one, ready to go deal which is prepared for use as soon as you get it out of the box. 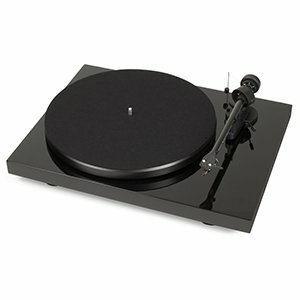 There is no assembly required, and no need to purchase additional components in order to get the turntable working. Many steps have been taken to increase performance, of which the ingenious step of decoupling the motor to reduce vibrations which could interfere with the audio output is the most noteworthy. More on this later on. As we said, set up was a pretty much non existent process. But if you manage to struggle with any aspect of it, Pro-Ject has made a video tutorial easily available on YouTube to guide you through the ropes. The noise levels were the first thing that we evaluated, and found that while some noise was audible when we began to listen it quickly dies down into the background. The decoupling of the motor has a noticeable benefit as you can see that all the noise associated with the movement is entirely removed from the equation. When listening to rich, dense albums with lots of moving parts and complex melodic lines, we found that the Debut III managed to reproduce the audio with aplomb. The delivery was nuanced, accurate, and pretty much free of irregularities and errors which are often associated with turntables at this price range. All in all, a really profoundly good listening experience that was far beyond what we anticipated.